Walnuts are rounded, single-seeded stone fruits of the walnut tree. Kashmiri walnut kernels are well known dry fruits in India. Walnuts are great source of those all-important omega-3 fatty acids.The kernels are enclosed in round or oblong shells that are brown in color and very hard. Walnuts are rounded, single-seeded stone fruits of the walnut tree. Kashmiri walnut are famous in India. Walnuts contain a number of neuroprotective compounds, including vitamin E, folate, melatonin, omega-3 fats, and antioxidants. Walnut kernels(Akhrot Giri) are divided into two; walnut halves i.e. the entire fruit broken into 2 halves, other one is kashmiri walnut kernel quarter pack in which the kernel is divided into 4 pieces. Walnuts are a delicious way to add extra nutrition, flavor and crunch to a meal. Walnut kernels rich source of antioxidants and vitamin E.
Walnut kernels are considered "brain food" due to its high levels of omega-3. Walnut kernels are also a nice source of protein. Walnut kernels helps in weight loss. Walnut kernels may help to prostate breast cancer. 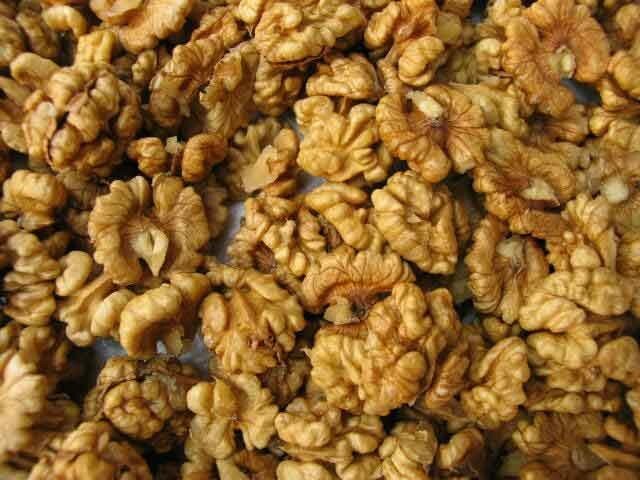 Walnut kernels benefits to people with heart disease. Walnut kernels improved reproductive health in men. Buy walnut kernels online at KiranaPlace, from anywhere in India.